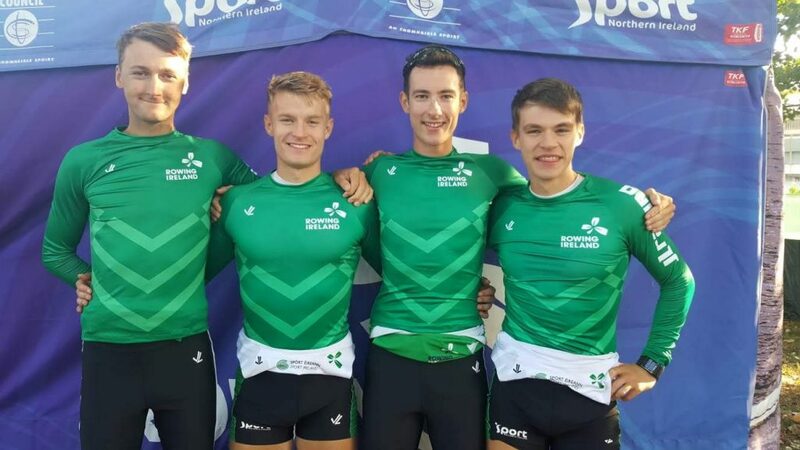 The Irish Lightweight Men’s Quadruple Schulls team of Andrew Goff, Jake McCarthy, Ryan Ballantine and Fintan McCarthy who are through to Friday’s A Final at the 2018 World Rowing Championships in Bulgaria. Waterford rower Andrew Goff will compete for Ireland in A final of the Lightweight Men’s Quadruple Sculls a the World Rowing Championships in Plovdiv, Bulgaria tomorrow morning (Friday). The former Waterford Boat Club man, who now rows for UCD has won silver and bronze medals with Ireland at the last two World U-23 Championships and this is his first time competing at the senior grade in a team that has never rowed together competitively before this week. Yesterday the Irish boat, stroked by Andrew Goff, with Skibbereen twin brothers, Fintan and Jake McCarthy, and Enniskillen man, Ryan Ballantine on board, showed excellent form in their repechage, breaking away from the field in the early stages of the race to secure second place behind Turkey to qualify for the A Final. It’s an outstanding achievement by the young athletes who are all aged under 23 and who are racing together not only for their first time at a senior World Championship event but for their first time as a crew. Goff and Ballantine won Silver at the World Rowing U23 Championships in July while the McCarthy brothers placed fifth at the same event, racing in a double scull. This new senior crew was formed in early August and spent three weeks training at a camp in Banyoles, Spain, under the guidance of Ireland High Performance coach, Dominic Casey, where they physically and mentally prepared for the Senior World Championships. The lightweight men’s quad will race in the A Final against Italy, Germany, Turkey, Denmark and the Czech Republic on Friday morning at 10.30 am Irish time. Best of luck Andrew and team….